Over the course of the last few weeks, it's been exhilarating to hear everyone's fantastic feedback about Hunt to Read and our analytics. By all means, please keep all of the comments and questions coming, no matter how "harsh" you might think them--each one helps us build a better site for authors and readers alike. It got me to thinking: here we have this perfectly good blog sitting around. Yes, we tell you about all of the great new updates to the site, and sure we've given you a little bit of a look behind the curtain at "our analytics," but let's be honest--so far, it's been a lot of us tooting our own horn. "Look at HTR! Look how great we are!" We decided it was high time that we started providing you all with a reason to visit the blog more regularly, which means providing value. It's something we're going to try to do by implementing a number of regular series, which should help you use the site, inform you about trends and changes in the book business, help authors peddle their wares a bit, and even give you some analytical insights based on the data we've collected to date. 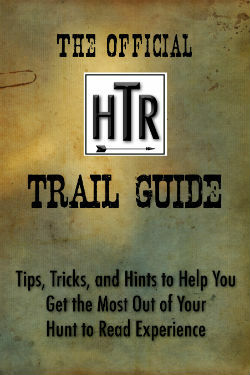 To start things off, we're going to launch our "Trail Guide" series of posts. The Trail Guide is meant to be a tool to help readers and writers alike get the most out of their Hunt to Read experience. We'll give you tips on how to interpret data, shortcuts to better navigate the site, and some ideas for new things to try out. Before we get ahead of ourselves, though, because the vast majority of site users at present are authors, we thought it would be prudent to do a post on how to interpret all of that delicious data we're providing. Data is one of the most important sales tools an author or publisher has. Anonymous data of the type that Hunt to Read provides, can be used to get honest opinions from others on covers, blurbs, and overall book presentation. If you don't know how to properly use this data, though, it's useless as a marketing tool. So we're going to go through quickly, number by number, and show you folks what all these powerful pieces of information can do for you. Showed on Hunt Page: This tallies up the number of times people have seen the book on their "Hunt" page, scrolling through books. Book Detail Page Hits: This isn't necessarily the same as "Click throughs," as users might favorite your book, or stumble upon your listing directly as opposed to finding your book through a hunt. So this is the aggregate number of times your book detail page was shown. Average Hunt Time: The average amount of time someone spent on your book while in the "Hunt" page. Longer times here (upwards of a couple of seconds or so) may indicate an initial fascination with the book's cover, or at least some interest in your book. Average Book Page Time: The amount of time that people spend on your book detail page, on average. Again, the higher this number is, the more they may be checking out your blurb, rating, commenting, etc. However, if you're getting low book page times but a lot of affiliate links, your book presentation is likely so good that people want to head to retailers directly to get it--congratulations! Page Hits Per Day Graph: This shows the above information in graphical format for those who prefer a visual presentation. Number of Click Throughs: This is the number of click throughs your book has received from the Hunt. Click Through Rate: The percentage of people who click through to your book detail page from the Hunt. What we've seen thus far is that double digits is fantastic, 6-10% "pretty good," and 0-5% your cover, title, etc. might need some work to draw more readers in. Comments: This shows the comments that other users have left on your book, complete with the number of HTR Points that they have so that you can gauge how heavy of a site user the person is. Comments can be upvoted or downvoted, gaining the commenter more points in the process. Book Ratings and Graph: The number of ratings that your overall book presentation has received. The higher the "Average Rating," the better your presentation is. We also give you the number of total ratings so that you can account for a "small sample size" bias. Cover Ratings: Same deal with the ratings for your cover. How many, how high, average, number, etc. Description Ratings: Ditto for your book description. Affiliate Links: The bread and butter: how many people clicked through from your book detail page to get to a retailer? Try to match this up with your sales data to see if there's been a spike. If you aren't selling any extra, consider the things on the retailer page specifically that might be impacting your sale; if you get consistently high cover, blurb, and presentation ratings, maybe you have bad reviews, or your "Look Inside" isn't as good as it could be. Take an objective look at this data, eliminate the knowns, and work on the unknowns. Activity: This shows you the "click log" of activity on the site. You can see recent clicks on your books, and the approximate location of where they came from. Eventually, we want to collect this information into a map format so that you can get regional ratings of your book. This should eventually give you information on where to plan promotional outings and advertising opportunities. Folks don't care for your book in the south but it's a hit out west? Schedule more booksignings or conference visits out there. Isolate What You Can, Explore the Rest: We can give you a lot of data on a bunch of specific things that Amazon, Barnes and Noble, and the other big reatailers can't even give you; Amazon can give you the buying patterns of their customers going back to inception, but they can't tell you why customers bought your book outside of "it's linked in our algos to some other book. "We allow you to parse this information out, to see if you have a good cover and/or blurb, and then to eliminate that as a potential factor in lower sales. We plan on a lot more customization for power users in the future, but for now, those are two huge variables in the bookselling world. Once you've either determined that those aren't the issue, and/or have fixed them up, then you can look at the other variables on a retailer's site to see if the "Look Inside," author bio, keywords, etc. need some work. We're working on exciting new ways to help you do all of that on HTR in the future, but for now, you can cut down the uncertainty of what's "wrong" with your book (or just what's "not as good") quite a bit. You Can Test! Book not published yet? Book is published but you're thinking about putting up a new cover? What's to say that you can't test one book presentation against another on HTR and solicit feedback that way? No one's stopping you; go ahead and create another version of your book. I did it with my novella, Rogue, when I changed the cover and blurb. I'll have more about this concept in a future post; we're working on some cool stuff here at Hunt to Read in this regard. Actively Solicit Opinions: If you click on your User Name in the black menu bar, and then click "My Listed Books," you get to a list of your items on HTR. Click the "Manage" button next to any given book, and you can see the direct link to your listing on Hunt to Read. We're working on making this link shorter and more manageable now, but you can direct fans, friends, family, etc. to visit your book link directly and give you honest, anonymous feedback on your various book marketing materials. Maybe your sister liked your book, but hated the cover--now she can tell you so without you being able to see so much as a user name, the only "identifying information" being the approximate location in the click log, which is good for pinning down regions, but not so good for specific cities, etc.Experiment and Have Fun! When my Co-Founder, Rick Tucker, and I started Hunt to Read, we were hoping that people would start experimenting with the site organically. That's part of the reason (aside from our personal beliefs in free speech and expression) that we made so few rules for the site; want to A/B test? You don't need our permission!We're giving you extended free access to these powerful tools so that you can play around with them and use them in ways that we never dreamed of. We have a lot of ideas for ways to expand the anonymous data available on the site to authors and publishers, and means to use the already-existing suite of data, but there are a lot of ways to use these numbers that we haven't even thought of yet. Though we have a plan for the site, we're not fortune tellers by any means--we give you the tools to sell more books and some visibility, but it's up to you to use them! Go ahead, play around with our analytics a bit--as long as it's legal, it's pretty much fair game on Hunt to Read (semi-literally).